When you travel to a new place, there is always a story. It wakes the inner poet in us and gets us spinning amusing tales about the experience. Trust me on this, if you are a vegetarian and travel to different countries, you will find even more stories to tell! On most of my travels abroad, I faced situations where I could not find any decent veg option to eat. Once when I was traveling solo in Sydney, I decided to visit the famous Bondi beach. I enjoyed looking at multi-million dollar properties around the beach and had a great time walking along the white sand beach. Fun fact: Did you know that Hugh Jackman owns a lovely property on Bondi beachside? It got quite late and I was hungry. I spotted a McDonald’s across the street and decided to grab a bite. As I could not find any vegetarian option on the menu, I requested the waitress to just give me a burger without putting in the meat. She said that it cannot be done, but kindly suggested me to remove the meat from the burger after I buy it and eat. I really did not understand why they could not just give a plain burger! After some time I found a Hungry Jack’s that served vegetarian burgers and literally lived on them plus some fruits for the entire trip. Such experiences though troublesome at the time can get amusing in retrospect. Funny, how a little time changes inconvenience to fun! Don’t you agree? Even when travel gets stressful because of things we can’t control, we should not stop traveling. 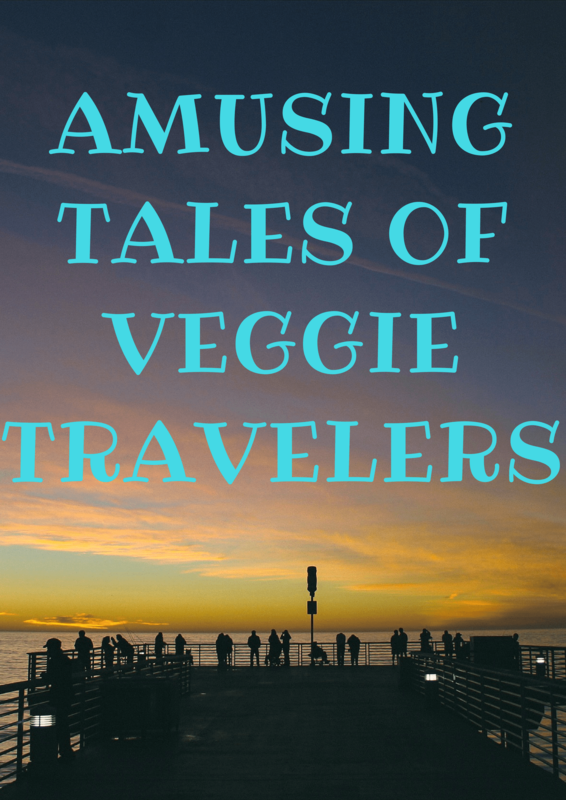 Here are a few more amusing tales from fellow travelers and blogging buddies of mine. These lovely ladies speak about their own ‘Veggie in the meat-land‘ experiences and a few tips to face such situations sensibly the next time around. ‘Jollies and Jaunts’ is a UK-based travel blog featuring things to do, destination guides and hotel reviews. It is run by Kaleigh, who loves city breaks, craft beer and cheese. Her blog is at jolliesandjaunts. On a recent visit to Budapest, myself and my other half were in a bar after a few beers and feeling peckish we noticed they had a small panini menu available. Hungarian isn’t really a language you can figure out if you don’t know any basics of the language, but rather than going to the bar and asking what the ingredients were before ordering like a sensible person would, we just guessed and ordered one as it sounded like it was just cheese. When it arrived, my OH remarked that he thought it was a very salty cheese and then realized that it was in fact, ham. The word that we thought was cheese (mozzarella) was in fact mortadella – which we discovered on our return home was an Italian ham. D’oh! Though Helen works full time, she is always planning another trip. She writes about making the most of her holiday allowance and keeps trying to visit all the European capitals. Check out her blog at helenonherholidays. So I’ve never starved as a travelling vegetarian but I have on many occasions experienced the dreaded hangry. My partner and I have both been vegetarian for so long that we don’t really think about it at home. The UK is an awesome place to be veggie, and vegan food is becoming more common too. But when we’re travelling it’s a different story. Some of the places most famed for their food are actually the worst to be vegetarian. Take for example our recent trip to Valencia. Home of paella, loads of tapas restaurants, the awesome market with all the jamon stalls. Trouble is, when you’re vegetarian, these local delicacies are off-limits and that’s the time when the risk of hangry (being angry because you’re hungry) is real. It’s easy to see the signs; it most often sets in when we’re somewhere with a great food scene, but we’re going from restaurant to restaurant looking for something that isn’t meaty or fishy, will fill us up, tastes OK, and isn’t pizza. We’re both tired, hungry and frustrated and that’s when the hangry sets in. Ten minutes later we cave and go back to that pizza place we went to last night or hit the vending machine in the hall. I avoid the hangry by being prepared and doing my research. Searching out vegetarian food in foreign places has given me experiences I would never have had normally. On a trip to Sorrento and sick to death of pizza, we found the only place in town that sold veggie burgers and ended up celebrating the local football team’s win with the owner and his friends. In Reykjavik, the same quest took us to a quirky bar that was also a laundrette and a library. In Stockholm, a search for “vegetarian” on Tripadvisor found us an amazing Lebanese restaurant and a food court where we filled up on cheap curry. So my tips for travelling while vegetarian? Don’t stress too much, you’ll find something to eat. Slip some emergency snacks in your bag. Use the wisdom of the internet to find where other vegetarians go. And above all, avoid the hangry! Menorca is an Indian expat currently living in Switzerland and writing all about exploring Europe’s cultures, history and vegetarian cuisines. Check out her blog at europediaries. In the last five years that I have been living in Europe, I’ve had a lot of adventures and misadventures with finding vegetarian food and clarifying that I am not talking about fish! I immediately learnt to emphasize on ‘Kein fleisch. Kein fisch’ (No meat. No fish). Even started off asking ‘Haben Sie vegetarische Speisen?’ when in a hurry. I recall spending a lot of time walking around, looking for vegetarian food while visiting Strasbourg, France. Due to the early start of the day trip and the immense walking we had already done, I was eagerly waiting to have a sumptuous meal. Unfortunately, at least in the area that we were walking around, I was having no luck. After a good hour or two, we finally entered a fancy restaurant, hoping to find something suitable. I asked the waiter to help me out as I couldn’t really decipher all the French. He confidently pointed towards a dish on the menu, saying it would contain potatoes and might even be suitable for two people. So, there I was, extremely hungry, and waiting for the food to arrive. While my friends started enjoying the meat delicacies, I was served with a small plate of plain boiled potatoes, yogurt and some herbs?! Now I would need to find something else after leaving this place! Fast forward two years, this time in Paris. It’s my last day in the city and I wanted to see the Notre Dame again, visit the Shakespeare and Company Bookstore and enjoy a meal by myself before catching my train. I walked quite a bit past several restaurants and cafes, not exactly coming across anything other than grilled sandwiches. Eventually, I decided to enter one of the restaurants offering Pasta apart from other things. So, I request them for a vegetarian one and continue romanticizing Paris in my head. A large plate of Pasta finally arrives and it is plain Pasta with..nothing? Just butter? I start eating it but it is practically tasteless. So, I decide to just pay and leave, but not before addressing the issue and letting them know how I feel. ‘Sorry, we don’t really have anything vegetarian. And we didn’t know what to serve you.’ was the response. Before leaving though, I was served a coffee on the house. Check out my blog if you decide to visit France and want tips on food. Or even for tips when visiting Paris (or France in general) if you don’t speak French. So you see, there are pros and cons of being a vegetarian. There are chances of ending up with something totally tasteless. But it could often mean not having to spend too much time pondering over what to order if you only have one vegetarian dish in the menu! That did happen to me for real though – in a Mexican restaurant in Switzerland. Fortunately, the only vegetarian main dish was Enchiladas that I absolutely love. Win-Win! Shelley is a writing, blogging, world traveling mother of two. They sold their belongings in exchange to travel the world in July 2016. Check out her blog at thefourexplore. When we were in Cannes, France, I ordered a salad that had chicken on it. I politely asked the waitress if I could please have the salad without meat. She looked confused, maybe even slightly terrified but nodded her head and went back to the kitchen. After she brought out our lunch I saw it had some kind of white fish (maybe even crab?) on the top. I was slightly mortified and really hungry so I ended up just picking off the fish/crab/meat off of the salad and ate it anyway. Always make sure that you eat only thoroughly washed fruits and veggies wherever you go. Try to eat only foods made in front of you if you are eating from street stalls. When in doubt, order only food that require boiling. Of course, you can learn the local language before you leave 🙂 Check out tutors from Preply for this! It’s so weird to see how many troubles other bloggers had in finding veg food in south France, I was so lucky! Ah the perils of vegetarianism! Some of these made me chuckle! Aw, being vegetarian while traveling seems extremely frustrating and I had not really even thought about it (non-veggie here)! You and your fellow bloggers seem to have the right attitudes and make the best of the situation! This was quite a funny post. I feel sorry for anyone who can’t eat certain things. It must be so hard. I have a Vegan friend and she does a heap of research before hand so i think that is the key like anything. But most places are getting better. I don’t eat much meat but I still can if need be. Here’s hoping next time around, these bloggers don’t face the same bland food, or eating cheese thinking it was cheese haha. We had to shout at her to bring our food back; that was exactly what we ordered! Eventually, we found a website that listed vegetarian restaurants in each city we passed through. They sometimes took a bit of finding, but they were worthwhile! Yes, researching ahead always helps!